Video of partially completed High Temperature Gas cooled Reactor in China. POSCO’s subsidiary Hume Coal intends to extract coking coal for steel making from a mine near our village of Berrima in New South Wales. POSCO states in their 2015 report that Climate Change which is caused by the burning of these fossil fuels is a megatrend affecting all corners of society. The greenhouse gas emissions from this coal will directly threaten the future of our children, grandchildren and future generations through the impact of greenhouse gas emissions leading to dangerous global warming. The company knows the criticality of this because in November 2009 their owner, South Korea’s POSCO declared plans to eventually halt carbon emissions by switching to a hydrogen-based steelmaking process from 2021. That’s only five years away. Their stated ultimate goal is to produce steel using hydrogen produced by nuclear reactors to replace coal. Japan has designed a suitable meltdown proof Very High Temperature Reactor (VHTR) and China will commission in 2017 a similar High Temperature Gas Cooled reactor the HTR-PM. POSCO has viable options, doesn’t need more coking coal and publicly admits that its operations are causing global warming. The future is with POSCO’s stated commitment to nuclear energy using hydrogen reduction. Neither of these options have any use for coking coal and POSCO does not need the production from the Hume Coal operations. POSCO’s subsidiary Hume Coal intends to extract coking coal for steel making from a mine near our village of Berrima in New South Wales. As POSCO tell us in their 2015 report, Climate Change which is caused by the burning of these fossil fuels is a megatrend affecting all corners of society. The greenhouse gas emissions from this coal will directly threaten the future of our children, grandchildren and future generations through the impact of greenhouse gas emissions leading to dangerous global warming. Currently to make steel iron ore is melted in a blast furnace using super-heated air from burning coal. In addition to its role as a fuel, coal is also used as a critical component in steel production because the carbon from burning coal captures oxygen from the molten iron ore, emitting carbon dioxide in the process. This is known as “reduction”. New technology is being developed to use hydrogen instead of coal so that the output is steam instead of carbon dioxide. POSCO officials said the steelmaker is considering supplying hydrogen gas from its “SMART” nuclear reactors. It is looking at participating in a consortium for developing small or medium-sized nuclear reactors. So, after including 16 pages of commentary on global warming in their 2015 annual report how does POSCO’s actual performance compare to International practice? Well at present their pace is slow. 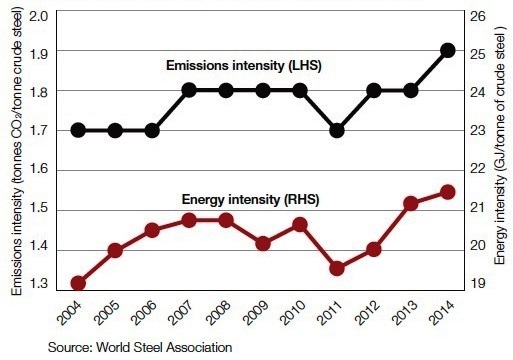 Reference to Figure 1 from the World Steel Association shows that in 2015 the company had an emissions intensity of 1.91 tonnes CO2/tonne of crude steel – about the industry average while its energy intensity was 21.9 GJ/tonne or just above the industry average. Since 2009 POSCO’s emissions reductions have declined slowly from 2.18 tonnes CO2/tonne crude steel which was well above industry best practice. 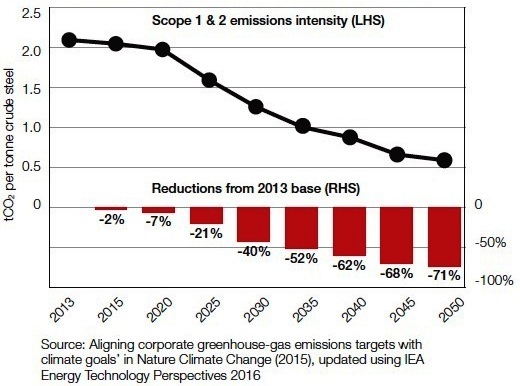 While they are in line with the reductions shown in the Steel Industry’s stated goals as shown in Figure 2 for a 2 degree transition pathway they are not in line with a 1.5 degrees warming scenario. Nor are they in line with the commitment made by POSCO in 2009 to switch to hydrogen based steel production by 2021. POSCO’s stated aim in 2020 is to achieve a voluntary emissions intensity of 2.00 CO2/tonne crude steel. In summary therefore POSCO’s self imposed target by 2020 is now higher than their current performance. Its worth questioning why POSCO cannot have a target in 2020 at least in line with Swedish steel maker SSAB of 1.5 CO2/tonne crude steel. The solutions to greenhouse gas emissions in the steel industry come from either sequestering the carbon dioxide which is not a promising technology or by using hydrogen reduction as acknowledged by POSCO. Currently industrial hydrogen is produced in a process known as steam reforming and takes place by mixing steam with methane at high temperatures. It’s an energy hungry process that produces carbon dioxide as well as the hydrogen and is of no benefit for emissions reductions. Hydrogen steelmaking uses hydrogen (H2) as a reduction agent and fuel instead of the carbon in coal. It uses oxygen (O2) for the burning of that fuel and refining of steel in the electric arc furnaces. This can be made with no carbon emissions using a water splitting process. 2 Thermo-chemical where a combination of several reactions proceed at high temperatures to produce hydrogen such as the iodine–sulphur (IS) and copper-chlorine (CuCl) processes. Both methods proceed more efficiently at elevated temperatures of variously between 450 to 950 oC. The energy demand of the method can be supplied from a nuclear heat source such as a Very High Temperature Reactor (VHTR) or High Temperature Gas Reactor (HTGR). Integrating the nuclear heat source, the thermo-chemical hydrogen production process and the hydrogen steelmaking process means we can produce iron with extremely low CO2 emissions. The VHTR has been developed for several decades mainly in nuclear research institutes where the Japan Atomic Energy Agency (JAEA) has studied them most intensively. The VHTR is an advanced high temperature gas-cooled reactor (HTGR) featuring 950 oC of high temperature helium gas coolant and graphite moderators in the core. The VHTR can supply both high temperature heat through an intermediate heat exchanger and electricity with a helium gas turbine simultaneously. Therefore, both the heat and electricity requirements of the efficient iodine–sulphur process and steelmaking process can be supplied by the VHTR. 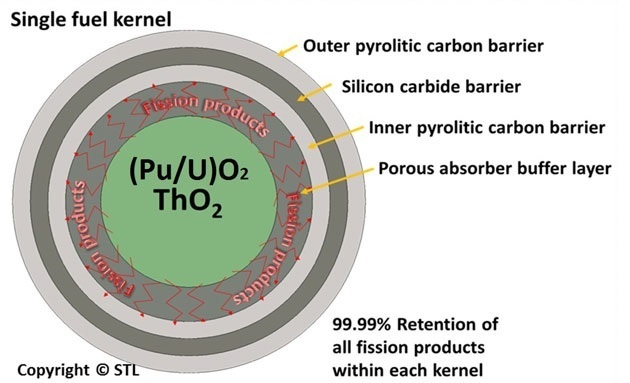 JAEA examined the applicability of several nuclear reactor types for hydrogen steelmaking was compared and VHTR was selected as the most promising. The hydrogen producing IS process has temperature requirement exceeding 850 ◦C which is attainable by the VHTR. The hydrogen and oxygen are supplied directly to furnaces from reactor using piping because VHTR can be installed near the steelmaking plant due to its inherent safety especially against melt-down. 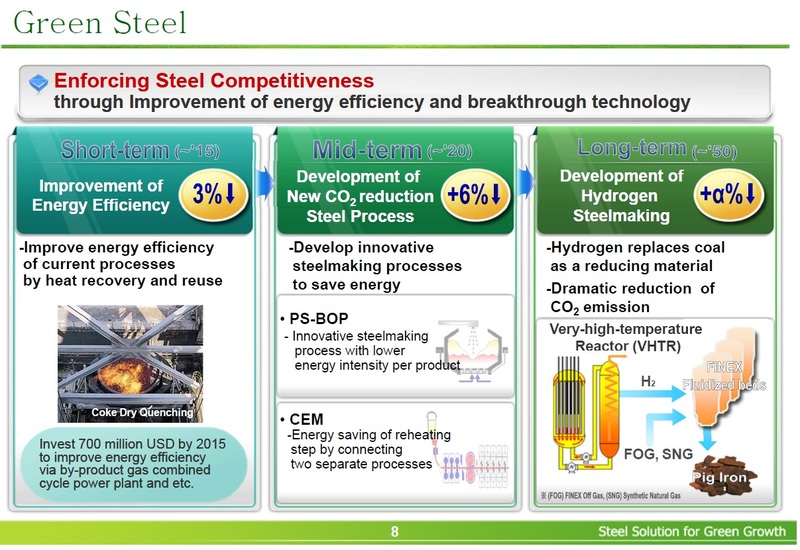 POSCO’s endorsement of this concept is shown in Figure 3 – POSCO’s 2013 time frame to low emissions steel making. The Standardized reactor modules with 1 2, 6 or 9 reactors with a single turbine (200, 600 or 1000MW) are envisaged. The lower power density, coated particle fuel performance and a balanced system design ensures that the fundamental safety functions are maintained. Consequently the HTR-PM needs no emergency core cooling systems as the decay heat is removed by natural mechanisms in case of emergency. Shown below is a video of the partially completed reactor followed by images of the TRISO fuel. These images are drawn from Steenkampskraal Thorium Limited (STL) who owns completed concept design of the similar HTMR100,a 35 MWe (100 MWth) HTGR. The Chinese HTGR will use a very similar fuel. 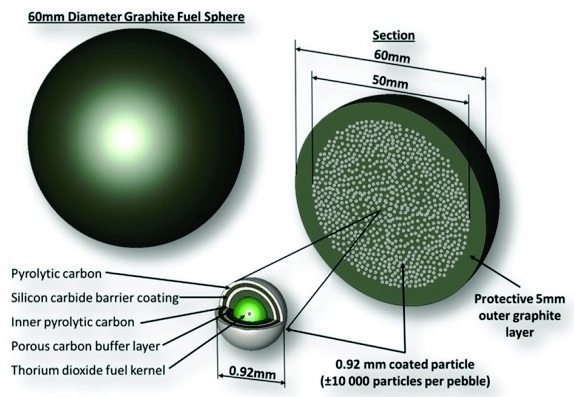 Thousands of single fuel kernels shown in Figure 5 fill each one of the graphite fuel spheres shown in Figure 6. The HTR-PM reactor contains 420,000 of these graphite fuel spheres. These pebble bed type reactors are cooled by helium which feeds the steam generator shown in Figure 4. The success of the HTR-PM will underpin future low carbon industrial applications including hydrogen production for steel manufacture, desalination and synthesising transport fuels such as di-methyl ether. Storing energy in hydrocarbon bonds leaves batteries for dead in terms of energy density. POSCO already has the FINEX process which it first deployed over a decade ago and produces steel using thermal instead of coking coal. FINEX is an innovative iron making process that directly uses iron ore fines and non-coking coal, replacing conventional blast furnaces. It is however only an intermediate technology because its carbon emissions reductions are only minor.